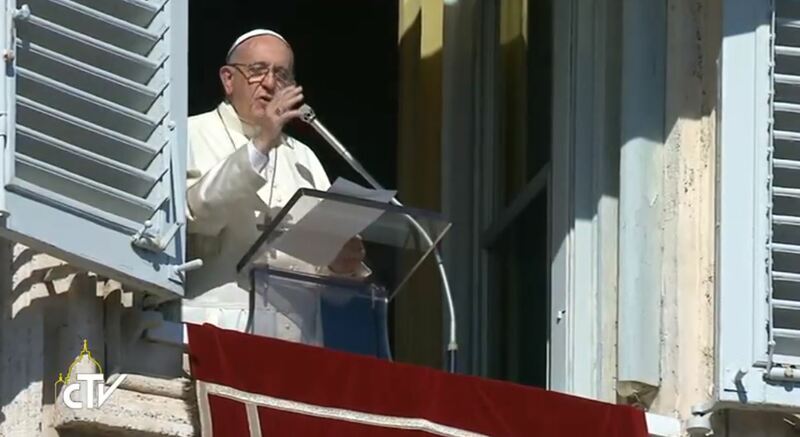 Here is a ZENIT translation of the address Pope Francis gave today before and after praying the midday Angelus with those gathered in St. Peter’s Square. Dear Brothers and Sisters, good morning and happy feast! The Solemnity of All Saints is “our” feast, not because we are good but because God’s holiness has touched our life. The Saints aren’t perfect models, but persons run through by God. We can compare them to the windows of churches, which let the light enter in different shades of colors. The Saints are our brothers and sisters who received the light of God in their heart and transmitted it to the world, each one according to his own “shade.” However, they were all transparent; they struggled to remove the stains and the darkness of sin, so as to have God’s kindly light pass through. This is the purpose of life: to have the light of God pass through, and also the purpose of our life. In fact, today in the Gospel Jesus turns to His own, to all of us, saying to us “Blessed” (Matthew 5:3). It’s the word with which He begins His preaching, which is “Gospel,” Good News because it is the way of happiness. He who is with Jesus is blessed, is happy. Happiness doesn’t lie in having something or in becoming someone, no. True happiness is to be with the Lord and to live for love. Do you believe this? True happiness doesn’t lie in having something or in becoming someone: true happiness is to be with the Lord and to live for love. Do you believe this? We must go forward to believe in this. Then, the ingredients for a happy life are called Beatitudes: blessed are the simple, the humble that make room for God, who are able to weep for others and for their own mistakes, they are meek, fight for justice, are merciful to all, guard purity of heart, always work for peace and remain joyful; they don’t hate and, even when they suffer, they answer evil with good. Behold the Beatitudes. They don’t require glaring gestures; they aren’t for supermen, but for one who lives the trials and hardships of every day, for us. Thus are the Saints: like all, they breathe the polluted air of evil that exists in the world; however, on the way they never lose sight of Jesus’s trace, that indicated in the Beatitudes, which is like the map of Christian life. Today is the feast of those who have reached the end indicated by this map: not only the Saints of the calendar, but so many “next door” brothers and sisters, who perhaps we have met and known. It’s a family feast, of the many simple and hidden persons that in reality help God to send the world forward. And there are so many today! There are so many. Thanks to these unknown brothers and sisters that help God to take the world forward, who live among us. We greet them with a hearty applause! First of all – says the first Beatitude – they are “poor in spirit” (Matthew 5:3). What does it mean? <It means> that they don’t live for success, power and money; they know that one who accumulates treasures for himself is not enriched before God (Cf. Luke 12:21). They believe, instead, that the Lord is the treasure of life, love of neighbor the only true source of earnings. Sometimes we are unhappy about something we are lacking or concerned if we aren’t considered as we’d like; let us remember that our Beatitude isn’t here, but in the Lord and in love: only with Him, only by loving does one live as blessed. Finally, I would like to quote another Beatitude, which isn’t found in the Gospel, but at the end of the Bible, and it talks about the end of life: “Blessed are the dead who die in the Lord” (Revelation 14:13). Tomorrow we will be called to accompany our dead with prayer, so that they will rejoice forever in the Lord. We remember our dear ones with gratitude and we pray for them. May the Mother of God, Queen of the Saints and Gate of Heaven, intercede for our journey of holiness and for our dear ones who have preceded us and are now part of the celestial homeland. I am grieved by the terrorist attacks of these last days in Somalia, Afghanistan and yesterday in New York. In deploring such acts of violence, I pray for the deceased, for the wounded and their families. Let us ask the Lord to convert the hearts of terrorists and to free the world from the hatred and murderous madness that abuses the name of God to disseminate death. A special greeting goes to the participants in the Race of Saints, promoted by the “Don Bosco in the World” Foundation, to offer the dimension of a popular feast to the religious celebration of All Saints. Thank you for your beautiful initiative and for your presence! Tomorrow afternoon I will go to the American Cemetery of Nettuno and then to the Fosse Ardeatine [Ardeatine massacre]: I ask you to accompany me with prayer in these two stages of memory and suffrage for the victims of war and of violence. Wars produce nothing other than cemeteries and death: that’s why I wished to give this sign in a moment where our humanity seems not to have learned the lesson or not wanting to learn it. I wish you all a happy feast in the spiritual company of the Saints. Please, don’t forget to pray for me. Have a good lunch and goodbye!